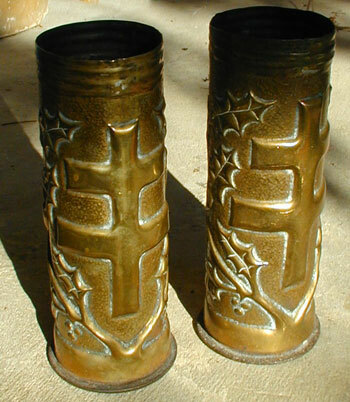 This beautiful pair of trench art vases are decorated with the Cross of Lorraine (Croix de Lorraine) and with sprigs of Holly (Houx). The Cross of Lorraine is the heraldic symbol of the Lorraine region of France, site of some of the most devastating battles of WWI. Originally it represented a reliquary containing a portion of the true cross and was used by the Dukes of Anjou. During WWII, Charles de Gaulle chose the Cross of Lorraine as the symbol of the French resistance. Since the early 20th Century the symbol has also been used to signify the battle against tuberculosis and other lung diseases - One explanation for this is the poison gas used during WWI, especially in the border regions between France and Germany such as Lorraine.